It will be the only V&A museum in the world outside London: an international centre for design, a place of inspiration, discovery and learning. 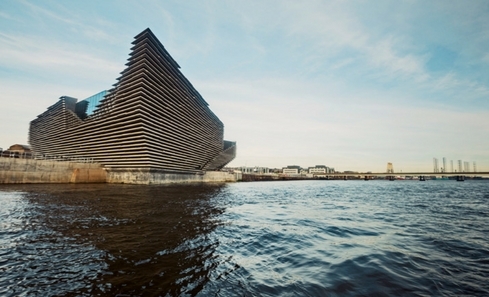 Visitors to V&A Dundee will experience the remarkable story of design past, present and future, and the vital contribution design makes to all our lives. 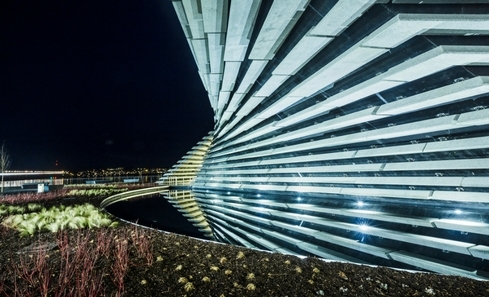 Designed by internationally acclaimed Japanese architect Kengo Kuma, V&A Dundee stands at the centre of the £1 billion transformation of the Dundee waterfront, once part of the city’s docklands. With its complex geometry, inspired by the dramatic cliffs along the east coast of Scotland, it stretches out into the River Tay – a new landmark reconnecting the city with its historic waterfront, and a major new cultural development for Scotland and the UK. 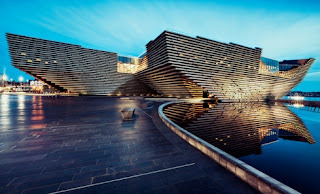 The new museum will feature permanent galleries of Scottish design, as well as an ambitious international programme of changing exhibitions showcasing the very best of design from around the world, new design commissions, fast-changing installations by emerging designers and creative projects developed through our learning programme for all our audiences. At the heart of V&A Dundee, the Scottish Design Galleries will tell the story of Scotland’s exceptional and international design heritage. Curated in collaboration with the V&A, these galleries will be free to enter and feature around 300 exhibits drawn from the remarkable collections of the V&A, as well as from museums and private collections across Scotland and the world, covering architecture, ceramics, engineering, fashion, furniture, healthcare, jewellery, textiles, videogame design and more. At the centre of these galleries will stand Charles Rennie Mackintosh’s magnificent Oak Room, fully restored and preserved for future generations in a partnership with Glasgow Life. The 13.5-metre-long panelled room was originally designed for Miss Cranston’s Ingram Street tearooms in Glasgow in 1907, before being saved – and placed in storage in hundreds of pieces – almost 50 years ago. Other key objects in the Scottish Design Galleries will include a beautifully decorated 15th century Book of Hours, a spectacular Cartier ‘Valkyrie’ diamond tiara, original Beano artworks from Dundee publishers DC Thomson, and the snap40 digital device which is designed to improve healthcare. The new museum enables V&A’s most ambitious exhibitions to be shared more widely across the UK. The opening exhibition Ocean Liners: Speed & Style, supported by players of People’s Postcode Lottery and investment managers Baillie Gifford, will explore the designs behind a mode of transport that came to represent the status of nations and the aspirations of millions. The show, organised by the V&A and the Peabody Essex Museum in Salem, Massachusetts, is the first to explore the design and cultural impact of the ocean liner on an international scale. It will re-imagine the golden age of ocean travel and explore all aspects of ship design from the remarkable engineering, architecture and interiors to the opulent fashion and lifestyle on board. Further exhibition announcements will be made ahead of the museum’s opening. The temporary exhibitions and permanent galleries will be complemented by exciting new commissions and installations, supporting and showcasing emerging design talent. The museum will also include: dynamic learning spaces to accommodate visitors of all ages and backgrounds to learn from and participate in design creativity; a design residency studio where designers will share work-in-progress with visitors; a multi-purpose auditorium for conferences, design jams and community events, and a restaurant with spectacular views from its open terrace over RRS Discovery and the River Tay. Philip Long, Director of V&A Dundee, said: “After many years of planning for V&A Dundee, we are absolutely thrilled to announce the date of the new museum’s opening. In just eight months we will be opening the doors and welcoming our first visitors. V&A Dundee is set to be a vital new cultural organisation for Dundee, the UK and beyond, helping to change understanding of just how important design and creativity are to people’s lives. 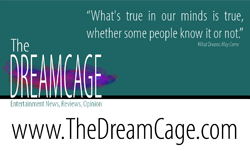 We are enormously grateful to all our supporters for helping to make this happen.